New York Governor Andrew Cuomo delivered what may be one of the most progressive and aggressive State of the State addresses in recent years. It what may be one of the most aggressive, and progressive, State of the State address issued recently, Governor Andrew Cuomo outlined several measures that would turn New York State into a model for the nation. Cuomo called for the nation’s toughest assault weapons ban, a women’s equality act, aggressive marketing for Upstate attractions, expanding the casino industry, restructuring the state’s power system and improving the state education system, to name a few. Marketing Upstate - The governor discussed a variety of existing and planned measures to increase tourism as a way of bolstering the Upstate economy. In addition to a multi faceted marketing plan to promote New York products, the governor announced that within the year duty-free stores will be opened statewide to sell New York-made wine, beer, yogurt and produce, among other goods. Within the following year, these stores will be transformed into a national chain. 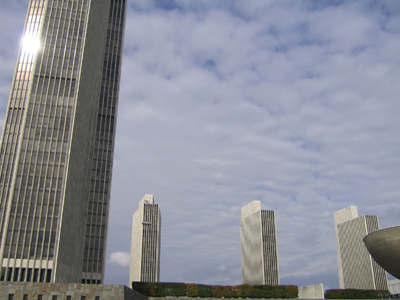 In addition to marketing around New York goods, regional attractions will be used to draw visitors to Upstate. Currently, counties are competing with each other to their mutual disadvantage, while developing regional marketing plans would create a synergy between regional cities, towns and counties. As an incentive, the state’s regions will be competing for a $5 million advertising competition for best regional marketing plan. Marketing for events, such as the new “Adirondack Challenge,” a white-water rafting race, and investing in destination resort casinos are also part of the governor’s plan to build the Upstate economy. Education - Suggesting longer school days and years, and beefed up teacher evaluation systems and performance incentives, the governor had two words for education in New York: “more and better.” An opt-in program for the state’s school districts would offer 100 percent of the additional costs in lengthening either the school day or the school year for districts that choose to do so, the governor announced, citing international statistics that show more classroom time leads to higher graduation rates and lower criminal rates. Pre-kindergarten would be made available throughout the state, offering five-hour days. The program would be implemented on a need-basis, beginning in poorer school districts. The governor said that he want’s schools in poor districts to turn into “community schools” -- the hub all of their needs, including education, healthcare, counseling and nutrition. Minimum Wage - Listing the average costs for gasoline, groceries, childcare and housing, Cuomo called for an increase to the state’s minimum wage, from $7.50 to $8.75 an hour. Discrimination - Here, the governor spoke of two specific examples of discrimination: stop and frisk, and women’s equality. The governor said that new stop and frisk measures are “making it harder to turn lives around at a very young age,” since 82 percent of New York City’s 50,000 stop and frisk arrests were of black and hispanic New Yorkers, over two-thirds of which were under the age of 30. He called for the decriminalization of the public view of marijuana under 15 grams. His audience cheered as the governor outlined his ten point agenda for the Women’s Equality Act, which would enforce equal pay, strengthen human trafficking laws, prevent housing and pregnancy discrimination and preserve the freedom of choice. “Because it’s her body, it’s her choice,” the governor repeated three times, to the growing applause of his audience. Gun Violence - “We must stop the madness,” the governor said of scourge of gun violence that has occurred recently, both in New York and across the country. The governor called for New York, which has the oldest gun control law in the nation, to continue to lead the way on this issue, to pass the toughest assault rifle ban among the 50 states. A seven-point law would increase penalties for illegal gun possession and use, keep guns out of the hands of the mentally ill, close background check loopholes and ban high capacity magazines. Campaign Finance Reform - Again, the governor called for New York to lead the way in enacting the toughest transparency laws in the nation, requiring the disclosure of all donations over $500 to any lobbying group, political party or 501(c)4 organizations to be electronically reported within 48 hours. Currently, organizations have up to six months and in some cases a full year to report such donations. Hurricane Sandy - The governor outlined a series of new initiatives to aid New Yorkers after Hurricane Sandy, including the Recreate NY-Smart Home program, which would contribute funding to rebuilding according to the needs of coastal areas. The Recreate NY-Home Buyout program would allow New Yorkers whose homes were destroyed by Hurricane Sandy to sell their land and move to higher ground. “There are some parcels that mother nature owns, she may only come to visit every few years,” the governor said, saying that it was a wise decision for some New Yorkers to not-rebuild in certain areas. The governor also called for a strengthening of various infrastructure elements, including New York City’s subway system, and establishing protective systems to protect Lower Manhattan, which rest upon a largely manmade addition to the island of Manhattan. Hardening electric, gas and fuel delivery systems are also necessary elements to preparing for the next major storm. The governor then turned his attention to Washington, which has, 73 days after the storm hit, only approved $9 billion in aid. “We need, and we deserve, federal assistance,” Cuomo stated outright, calling attention to the unprecedented lack of response from Washington, citing a long history of federal disaster relief. Subject: LongIsland.com - Your Name sent you Article details of "Cuomo: NYS to Lead the Nation on Gun Control, Women's Equality"